Our stock extruded plastic profiles are excellent for speedy fabrication of parts, moldings, edge protectors and much more. With materials ranging from soft and flexible to hard and rigid, our stock extruded plastic profiles are perfect for a variety of jobs. Contact our sales department for more information. "J" "L" "U" "Z" "Square"
Our stock square extruded plastic profiles are excellent for speedy fabrication of parts, moldings, edge protectors and much more. With materials ranging from soft and flexible to hard and rigid, our stock square extruded plastic profiles are perfect for a variety of jobs. Contact our sales department for more information. 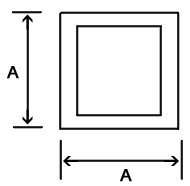 The available length for all Square Profiles is 8 feet. Our Stock J-Shaped extruded plastic profiles are excellent for speedy fabrication of parts, moldings, edge protectors and much more. With materials ranging from soft and flexible to hard and rigid, our Stock J-Shaped extruded plastic profiles are perfect for a variety of jobs. Contact our sales department for more information. 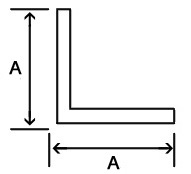 The available length for all J-Shaped Profiles is 8 feet. Our Stock U-Channel extruded plastic profiles are excellent for speedy fabrication of parts, moldings, edge protectors and much more. With materials ranging from soft and flexible to hard and rigid, our Stock U-Channel extruded plastic profiles are perfect for a variety of jobs. Contact our sales department for more information. The available length for all U-Channel Profiles is 8 feet. Our Stock Angle extruded plastic profiles are excellent for speedy fabrication of parts, moldings, edge protectors and much more. With materials ranging from soft and flexible to hard and rigid, our Stock Angle extruded plastic profiles are perfect for a variety of jobs. Contact our sales department for more information. 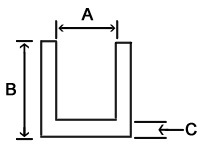 The available length for all Angle Profiles is 8 feet. Our Z-shaped extruded plastic profiles are excellent for speedy fabrication of parts, moldings, edge protectors and much more. With materials ranging from soft and flexible to hard and rigid, our Z-shaped extruded plastic profiles are perfect for a variety of jobs. Contact our sales department for more information. The available length for all Z-Shaped Profiles is 8 feet.